This stunning creation by Natasha Bieniek is the winner of the prestigious 2015 Wynne Prize for the best landscape painting of an Australian scene. It is entitled Biophilia. The exquisite detail in the painting is cause enough for admiration, but the realisation that all the detail is captured in a painting only 9 x 9 cm in size transforms admiration into awe. 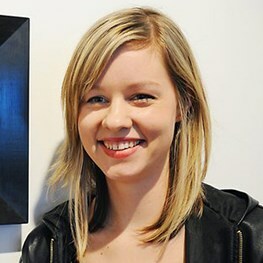 Natasha says that she is particularly interested in the impact of nature within an urban environment. My miniature oil painting, Biophilia, is part of a recent series that explores the way humans relate to the natural world. Biophilia literally means ‘love of life’ and references a scientific study that suggests our tendency to affiliate with nature is inherent and integral to our psychological and physical development. 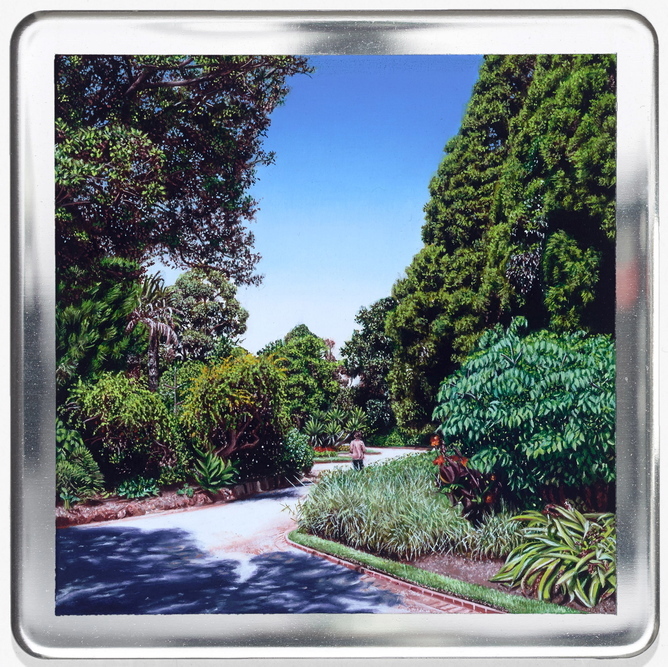 The inner-city landscape depicted in my painting illustrates a sense of tranquility that contrasts with its active surroundings. My intention is to draw focus on such diverse pockets of nature, and present the idea that we, as humans, are not above nature but very much a part of it. Apart from being an artistic tour de force, the painting reveals a deep insight into the features of nature that most reliably and powerfully evoke biophilic thoughts, emotions and actions. 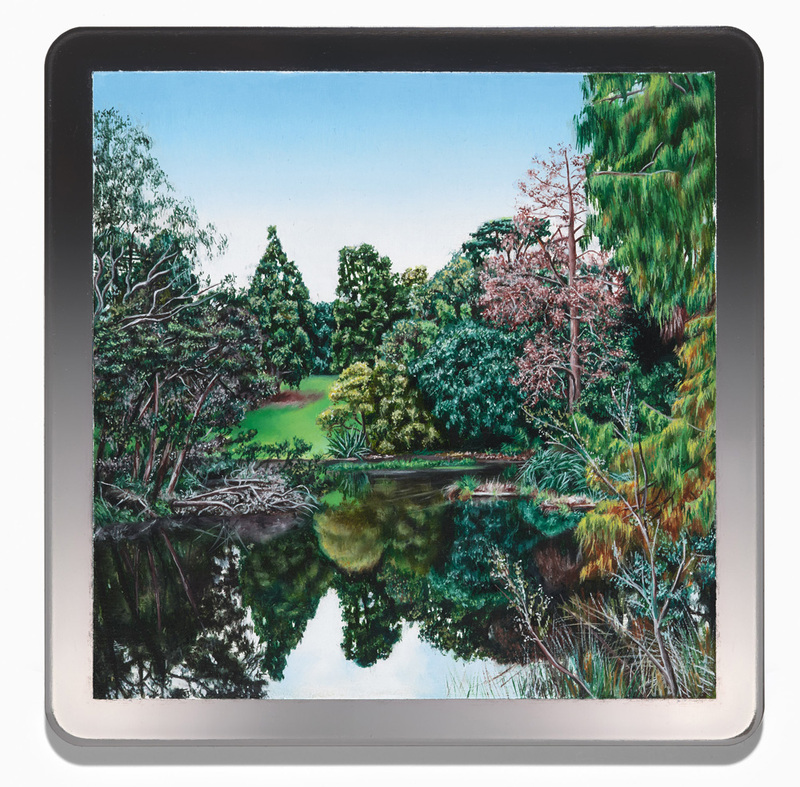 In this, another of Natasha’s miniatures in the “biophilia” series, she captures superbly what is arguably the most powerful biophilic features of all – still water bounded by greenery. This painting is also extraordinarily rich in fractal images – in the contours as well as the branches of the trees and shrubs. I have found that when my subjects are meticulously composed, it makes the translation more intelligible for the public at large, just as random music notes, once properly orchestrated, can enter the heart and sway it almost against our volition. Once an appreciation for the aesthetics of insects is born, it is amazing how quickly old prejudiced and stereotypes fall away. 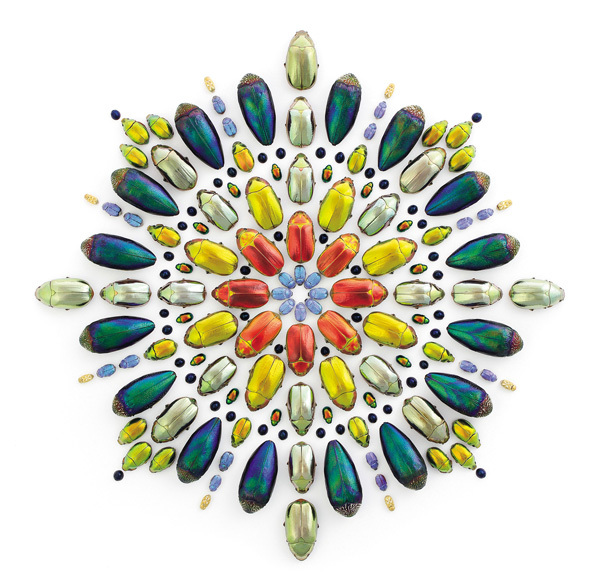 When people begin to see beauty where they had previously known only a mundane, distasteful, or even frightening world of arcane organisms, positive changes in their perceptions of arthropods as a whole are sure to follow. His primary purpose, Marley himself says, is to bring people joy. I have no problem with that. But I do question the assumption he appears to be making that insects and other “mundane” creatures need to be dressed up as art works in order to be attractive. 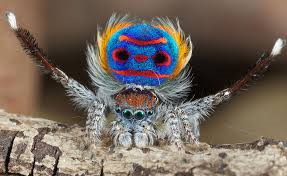 In my experience, taking the time to look is all that is required to discover the intrinsic beauty in nature’s creepy crawlies, like this tiny Australian Peacock Spider, for example. I enthusiastically commend Marley’s understanding of biophilia, however. It is a symbiotic relationship. The more we grow in understanding and appreciation of the natural world and the more we invest in it, the greater the peace, satisfaction, and joy we receive from our association in return, just as we involuntarily develop love for those people we truly understand and serve. As with all ordained goodness, the more we give, the more we receive. This is not exactly a pet rock, but it is a treasured one. It was found for me by my daughter, Wendy, on a trek up the mighty Kali Gandaki River to Upper Mustang in northern Nepal. Its shape indicates that it had been carried by the river for a considerable distance, being rounded and smoothed along the way. Its composition of dense, tiny grains tells us that it is formed from mud deposited in a large, shallow, gently moving body of water. 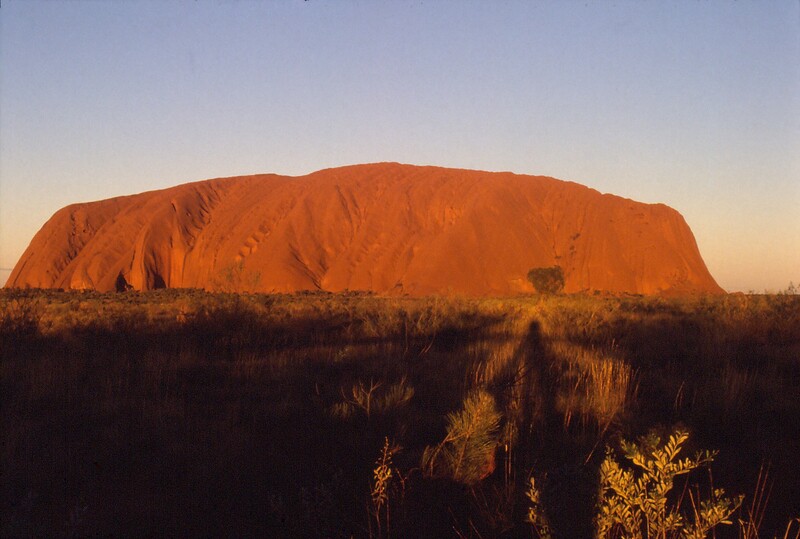 In the mud there was decaying vegetation which is responsible for the rock’s dark grey, almost black, colour. Just a common old, run-of-the-mill lump of shale, you might think – that is, until you see what’s inside. 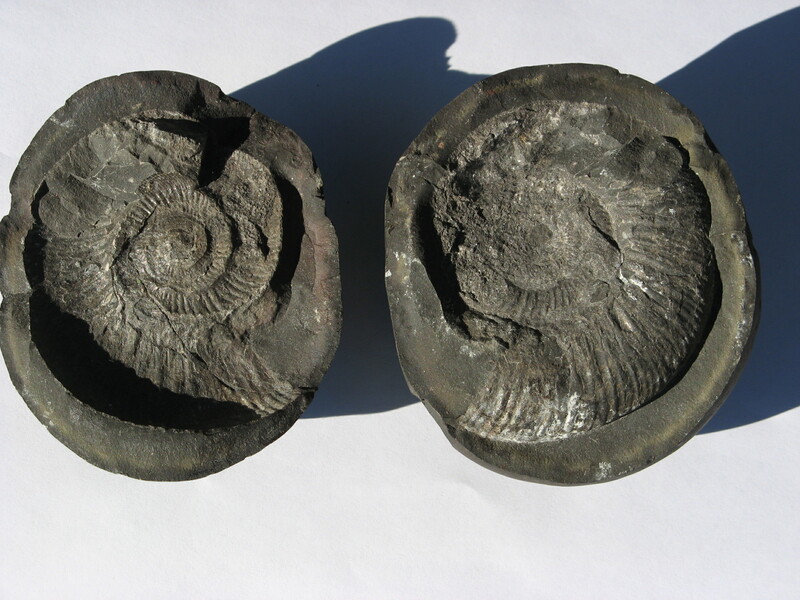 What’s there is an ammonite fossil with its typically ribbed, spiral-form shell. 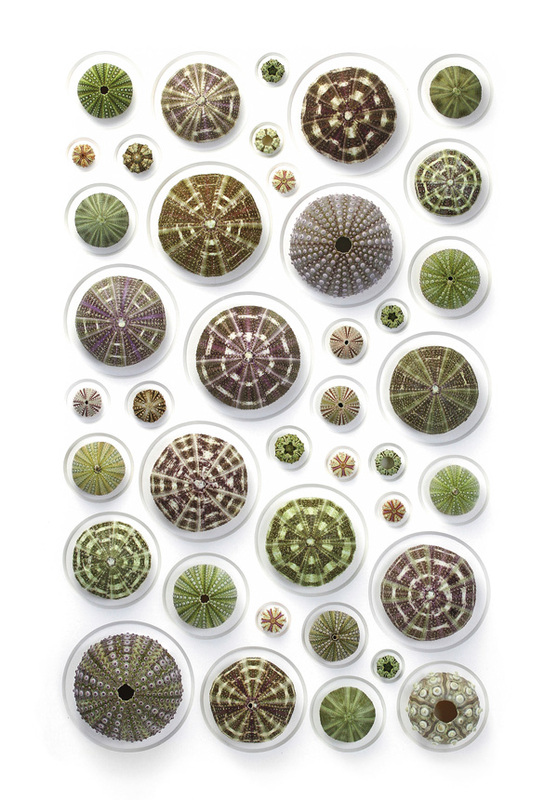 Ammonites lived in seas between 240-65 million years ago, becoming extinct at the same time as the dinosaurs. This particular specimen lived in the Tethys Sea which existed until 60 – 80 million years ago between the continents of India and Asia. As the tectonic plate on which India sits drifted north into Asia, part of the Tethys Sea floor was concertinaed and pushed upwards to become the mighty Himalayas of today. So it is not surprising that this ammonite finally came to rest thousands of metres above present-day sea level and many hundreds of kilometres inland. The rock that forms the ammonite’s sepulchre has special significance for Hindus. 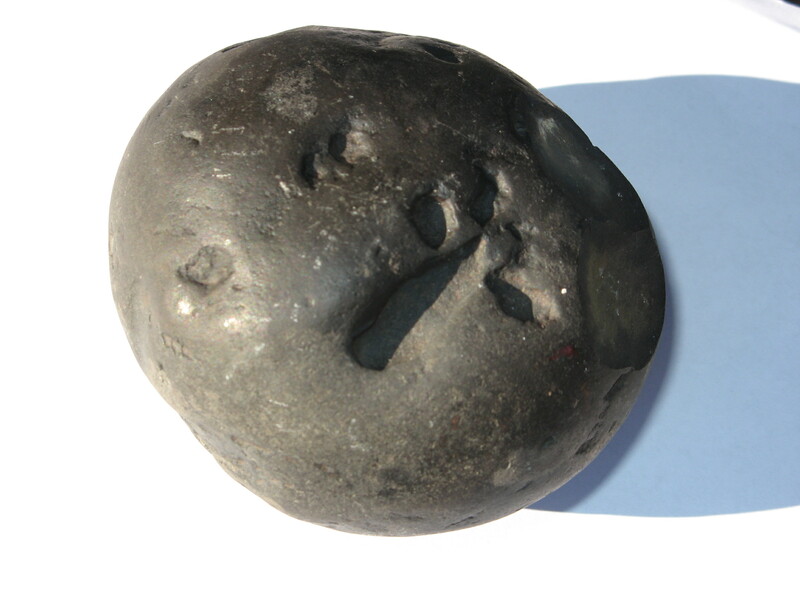 It is a sacred and venerated stone, known in Nepal as a Shaligram. I have my Shaligram on display not only because it is interesting to look at but also because it serves to remind me of the wonders of rocks in general. In my blog posts, I have talked about all sorts of natural features – forests, flowers, trees, lakes, rivers, beaches, waterfalls, the blue sky, the night sky and so on – but not rocks, at least not directly. Of course, many natural features are formed totally or largely from rock and their particular attributes reflect the nature of the rock from which they are made. But it is rock as rock that I have not written about. I feel a little neglectful about this because I get a great deal of pleasure and interest from rock. Take my Shaligram, for example. I marvel in the fact that it is not simply an object but a record of events that happened tens or even hundreds of millions of years ago. And because the geological processes at work today are the same as have operated throughout Earth’s history, we can imagine some of those events. We can see in our mind’s eye, for example, a slow moving, muddy stream winding across an oceanic delta gradually depositing its load of mud particles. We can imagine the ammonite in its buoyant shell floating above the layer of mud and then falling into the mud at its life’s end. We can also imagine the first of countless layers of mud being deposited on the dead creature until the layers were finally compacted into a rocky mass under the pressure of their own weight. I get a tingle of excitement when rock connects me to a very distant past and indeed part of our planet’s story in this way. 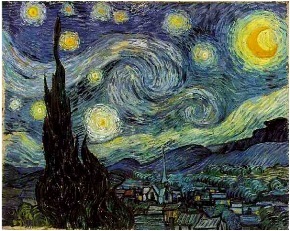 It helps me in a small way to get my mind around the immensity of geological and even cosmic time. When I can hold in my hand or simply look at something that has taken million upon millions of years to form, it somehow makes the vastness of that time a reality that is slightly more comprehensible. And beyond a rock’s history, there is its present – which can be a source of great aesthetic and other pleasure. 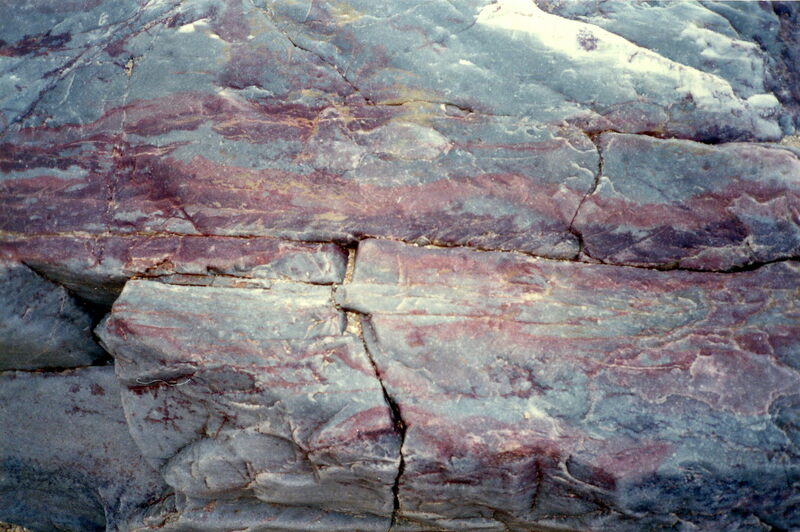 This beautiful colouring, for example, is in very ancient rock at the base of Ormiston Gorge in Central Australia. 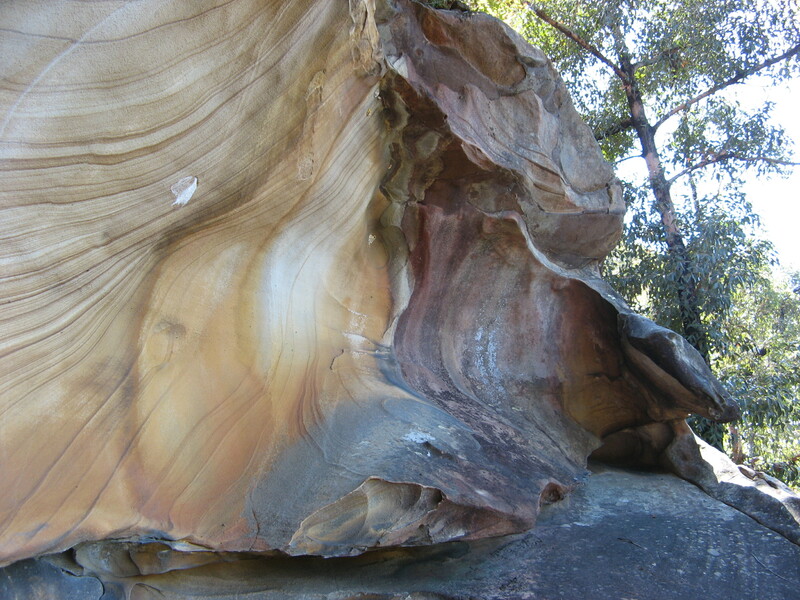 There is a different kind of rock beauty in these stained and sculptured rocks not far from my home in Sydney. 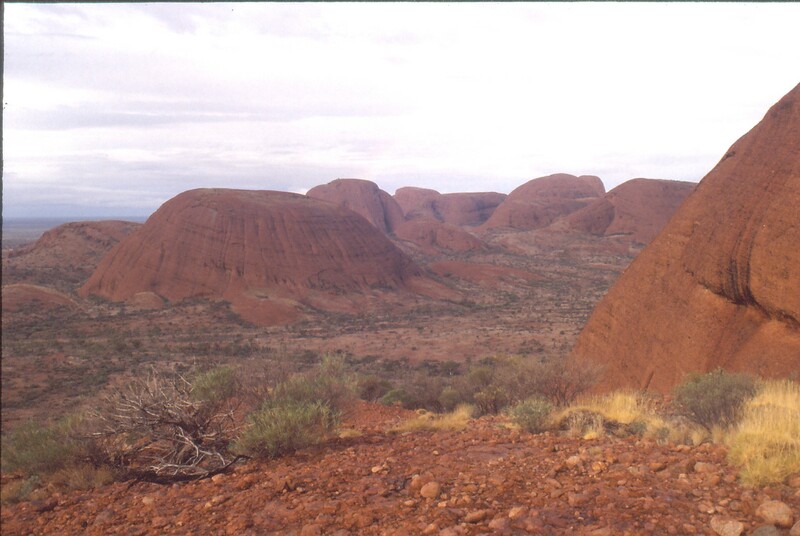 For Australians, Uluru is THE rock to admire and talk about of course, but the domes of nearby Kata Tjuta are equally breathtaking in my view. And in addition to enjoying the beauty of rocks, we can always “play” on them. How does the night sky speak to you? The recent conjunction of Venus and Jupiter, the two brightest planets in the night sky, had me doing a spot of star gazing. This brought back a memory from my days leading a bushwalking and camping course. The course was for adults and comprised a graded series of activities spread over five weekends. 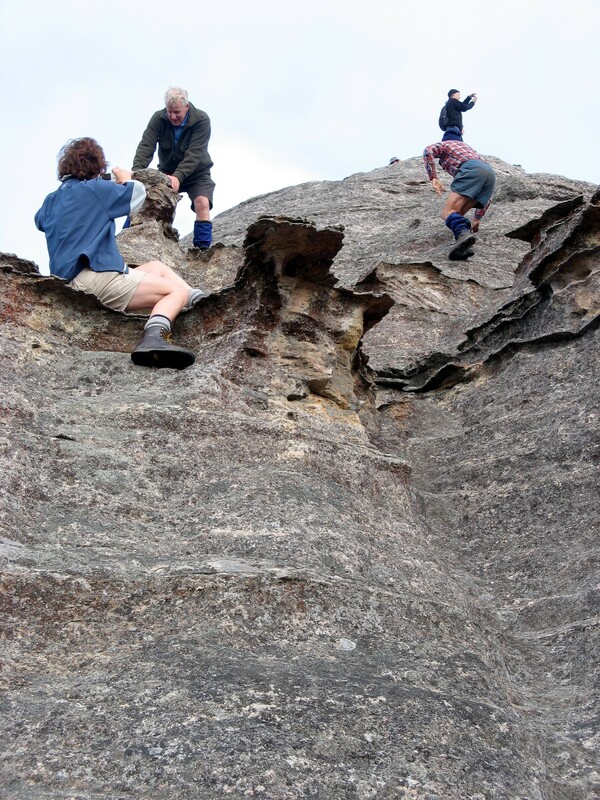 The second of these weekends involved a car camp where participants could do some bushwalking and practise basic camping skills without the added demand of carrying a full pack. 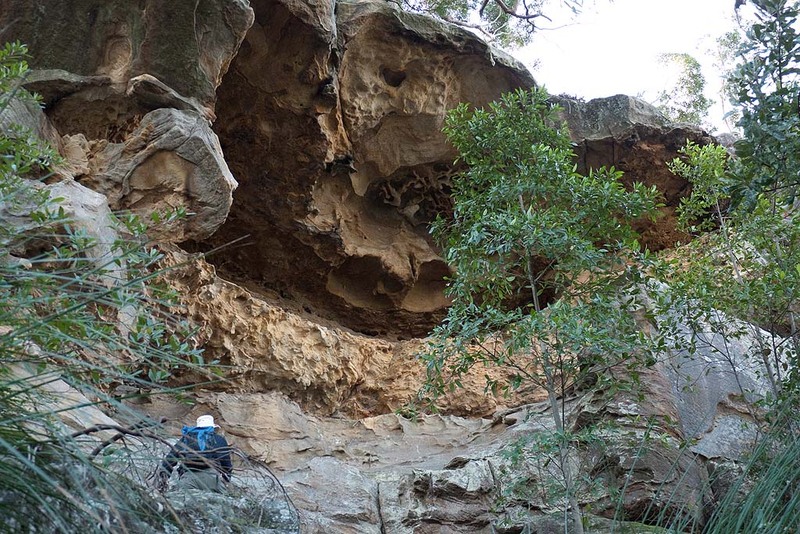 The camp was located in a the Garden of Stone National Park, which is part of the World Heritage listed Blue Mountains National Park west of Sydney. 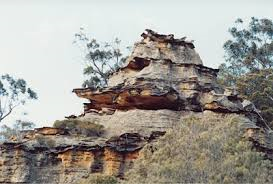 Much of the sandstone in the Garden of Stone has been sculpted by nature into picturesque and impressive pagoda-like formations. A short walk from the campsite was an easy-to-climb pagoda where it was comfortable to sit or even lie down. As the track to this particular pagoda was very broad and easy to follow and involved a short walk through a disused railway tunnel, I occasionally took participants on a torchlight walk to the pagoda. We would stay there for half an hour or so quietly talking and gazing at the night sky. For some, this simple excursion was the highlight of the course. This is really saying something as the course gave people some of the best walking and camping experiences on offer in the Blue Mountains and other National Parks around Sydney. I believe two things were at work to make the time looking at the night sky so special for my people. First, there was the novelty of seeing a bigger and brighter sky than would have been possible from their homes in heavily light polluted Sydney. Second, and probably more importantly, there was the awesomeness of the stellar display itself. We don’t need science to tell us that the night sky possesses a unique power to stimulate our senses, thoughts and emotions. It has been a constant source of fascination for humankind since antiquity – inspiring religious thought, belief and practice along with scientific observation, measurement and speculation as well as, poetry, music and art. Most certainly, taking time to look at a clear night sky is a deeply enriching – some might say sacramental – thing to do. 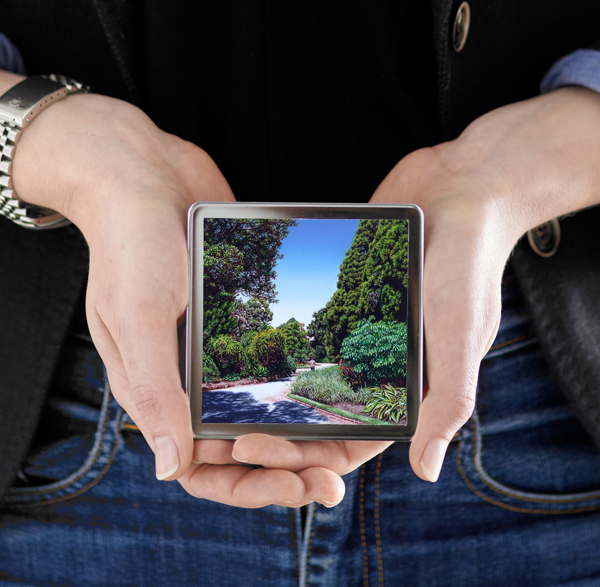 It is one of the most convenient and direct ways of connecting with nature. It can be done very simply by just gazing or it can be done purposefully and mindfully, with the aid of telescope and sky chart, for example. If you want to expand your sky gazing and you live in Australia, you will find very helpful information and resources by clicking on this link. When looking at the night sky we are, of course, looking at the universe, or rather, a tiny piece of it – enough, however, to get a sense of its incomprehensible vastness and mystery. This can be both awe inspiring and overwhelming. It can make us conscious of grandness but equally of our smallness and insignificance. But the world renowned astronomer, Neil de Grasse Tyson, prefers to dwell on the positive response. He points out that the chemistry of our bodies almost exactly matches the chemistry of the universe. In our bodies, hydrogen is the commonest chemical – just as it is in the universe. Next in order is oxygen, then comes carbon, nitrogen and “other” – again, just as in the universe. So that when I look up at the night sky, de Grasse Tyson says, I know that yes, we are part of this universe, we are in this universe, but perhaps more important than both of those facts is that the universe is in us. When I reflect on that fact, I look up – many people feel small ’cause they’re small and the Universe is big – but I feel big, because my atoms came from those stars. For de Grasse Tyson, the fact that the universe exists in us is enlightening, ennobling and enriching. And he finds the accompanying sense of connectedness “almost spiritual”. 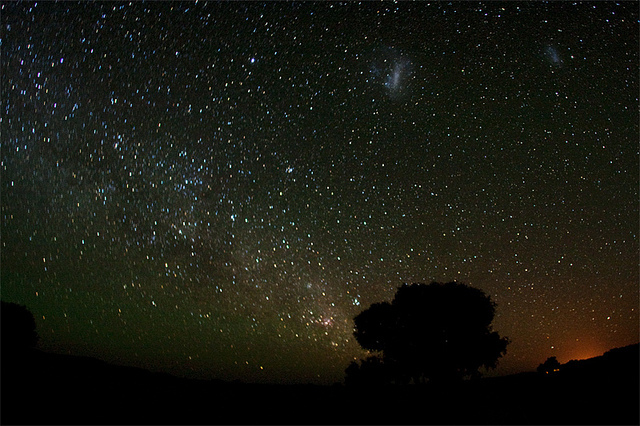 Perhaps the night sky can give you this same sense of connection – or it may speak to you in different terms. Sarah Jio tells us that “the stars have their own language”. This language may well be that of poetry rather than science, as it was for Henry Wadsworth Longfellow. For him the stars were the blooming “forget-me-nots of the angels”. What are they for you?